2012 K-8 Test Scores Released | Educate Now! The K-8 student test scores for Louisiana were released today, and New Orleans continues to improve. For the 6th year in a row, student performance is up. Growth was less robust this year. While the RSD outperformed the state, for the first time since Katrina, OPSB did not. 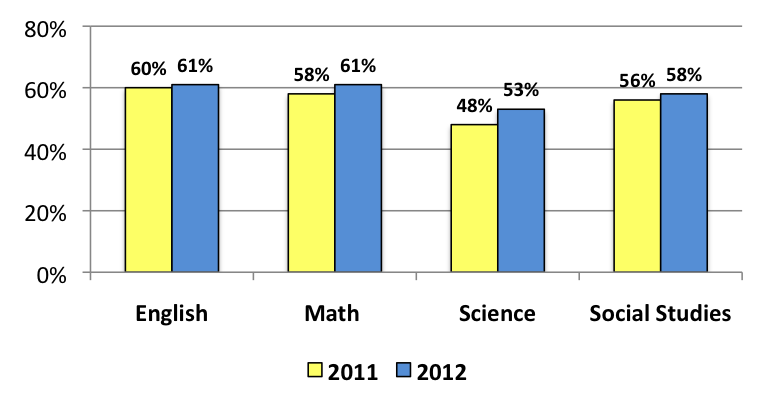 New Orleans Combined (OPSB +RSD) tied the state with a 2 point gain in the percentage of students Basic or above. New Orleans students performed better than last year in all four subjects (English, Math, Science and Social Studies). We reduced the percentage of students performing in the lowest category (Unsatisfactory). We increased the percentage of students performing above grade level (Mastery and Advanced). 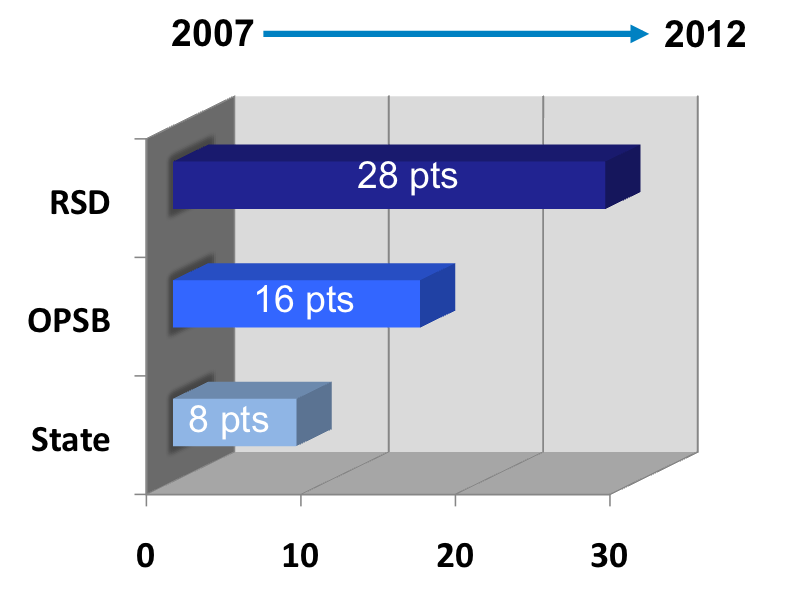 The percentage of New Orleans students (OPSB + RSD combined) performing at grade level (Basic or above) went up 2 points. The state went up 2 points as well. RSD New Orleans grew more than the state with an increase of 3.4 points in K-8 performance. The Orleans Parish School Board remained flat with a 0-point gain. The RSD leads the state cumulative growth since 2007; OPSB is ranked 5th. The percentage of students performing on grade level improved in every subject. This year, these citywide gains were fueled by improvement at RSD schools. New Orleans still trails the state in the percentage of students performing Basic or above. Each year, Educate Now! reports on the annual growth and performance of students and schools. Since 2007, the first “normal” school year post-Katrina, our schools have shown improvement. These annual gains don’t seem that major when viewed one year at a time – 4 points one year, 3 points the next. But they definitely add up over time. Educate Now went back to 2008 to look at our cumulative gains, and the impact is quite exciting. We have increased the percentage of students performing above grade level (Mastery and Advanced) from 9% to 17%. We have increased the percentage of students performing on grade level or better (Basic and above) from 40% to 58%. We have cut in half – from 32% to 16% – the percentage of our students in the lowest performance level (Unsatisfactory). Educate Now! has not analyzed the high school Science and Social Studies GEE data that was released today. This year, only the End of Course (EOC) tests will be used in calculating performance scores for the high schools. The Graduation Exit Exam (GEE) is being phased out and will no longer be included in the calculations. When the EOC scores are released this summer, Educate Now! will review the results and provide a report of high school performance. In 2012 the Department implemented new test security protocols. In addition to the erasure, use of words analysis and other safeguards used in the past, this year tests were no longer delivered to school sites 7 days in advance. Schools went to the RSD to pick up the tests a couple of days before the particular test was administered. Additionally, the Department of Education had test monitors constantly entering all schools at unannounced times. This year saw a tremendous variance in how well individual schools improved. Within the New Orleans averages, there are some schools that struggled (scores went down more than 10 points) and some schools – like John Dibert and Gentilly Terrace – that showed tremendous growth (more than 20 points). Educate Now! will review individual school performance when the performance scores are released later this year. We have had unprecedented improvement in student achievement over the past six years. We now face the challenge of continuing this growth. Each year it gets a bit harder as we work to increase the percentage of students performing at grade level. I believe the talented and dedicated educators across the city are up to challenge. But no one said it would be easy!